A landlord has a couple of responsibilities and obligations that he or she has to keep in order to maintain a healthy and positive relationship with the tenants. Aside from his or her responsibility to maintain the property, he/she is also mandated by law, depending on each state, to provide a reasonable compromise that will benefit both him/her and the tenant/s. Any move or decision that will directly affect the tenant, a landlord has to provide a formal notice stating the decisions. The notice should disclose the full premise of the decision or action along with the necessary actions that both parties should take; this helps ensures that tedious and expensive lawsuits can be avoided. In order to convey the message clearly to the tenant, you need to have a well-written notice. A notice should have the names of both parties, the date, subject line, and all the essential details relating to the main subject of the notice. Aside from that, you need to consider writing the notice 30 days before the effectivity of the notice to comply to laws within the state. 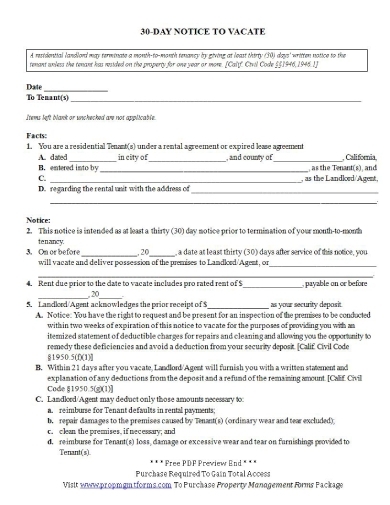 To help you easily do all of that, we have here a 30-day notice to tenant template that is easy to edit and customize. The number of days you issue the notice depends on what has been stated in the rental agreement or contract. A landlord must give at least 90 days written a notice to end the tenancy, but in some cases or reasons, a 30-day notice will suffice. If you want to have a template that is ready-to-use regardless of the notice period, you can make one just like this example. However, remember to provide options to determine the reasons, date, notice period, and so on. A landlord can issue a notice for any violation or legitimate reason a tenant needs to know and comply. 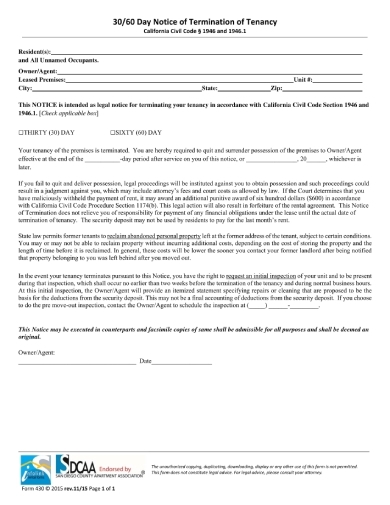 In this example, a notice to correct lease violation is given to a tenant to let him/her know that he/she has violated a clause stated in the rental agreement. Aside from that, the notice also notifies the tenant what he/she should do in order to correct and appease such violation. If a tenant continues to violate certain rules or policies that both parties have agreed on, a landlord should provide a notice to let him or her correct such violation. However, if he/she continues with the violation or does not comply with the premise of the previous notice, a notice to terminate a rental agreement can be issued. It can also be used to inform the tenant that certain decisions have been made and the premise should be vacated. The notice should include the final date for tenancy. Issuing a notice within the proper period of time will ensure that you can take necessary actions for a tenants’ noncompliance to the previous notice, it can also help when you pursue an eviction lawsuit. With this in mind, the notice to vacate that you issue to your tenant should have the complete details. Like this 30-day notice to vacate example, you can see how clear and direct the details are provided. 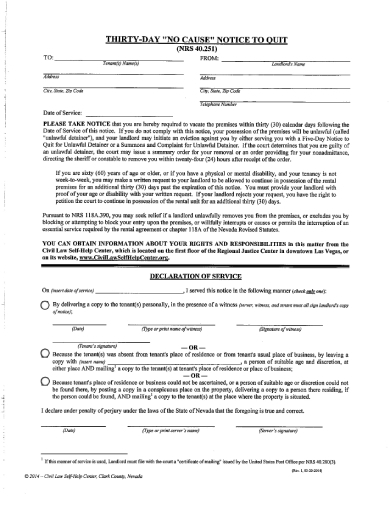 This 30-day vacate notice takes a letter format that makes it easier for the tenant to read through all the details. A notice letter includes the return and inside address, date, subject line, salutation, complete body paragraphs, and proper closing. 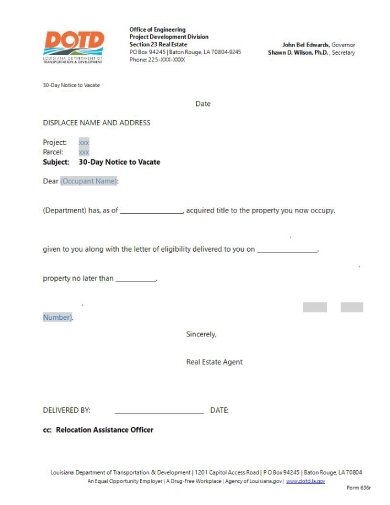 This example can be the format you use when you send a notice to vacate letter to your tenant whether through printed material or email. 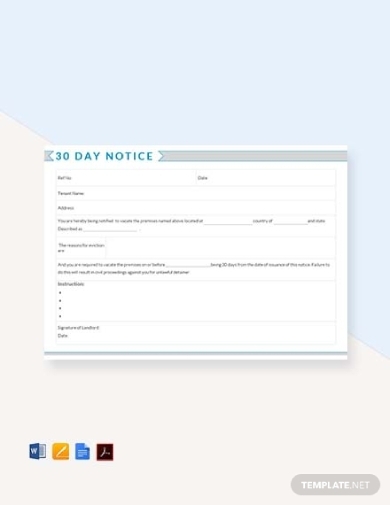 If you are looking for a guide on how you can write a clear and thorough 30-day notice to vacate, you can download this example. The example has a clear outline that will serve as your guide on how you can incorporate all the necessary details regarding your decision as a landlord. Furthermore, it has divided the topics with the use of headings to make sure it is easy for the tenant/s to understand. 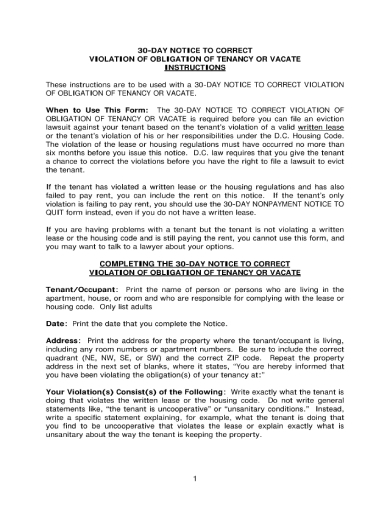 Give your tenants the right amount to prepare for the move with the use of this 30-day notice to vacate example. Using this example as your basis in making your own template will allow you to strategically separate the topics that should be discussed in the notice. By the end, you will have a comprehensive and complete notice to vacate template that you can use for your rental business. Having a notice form that you can easily fill out when the need arises will help you stay efficient with the whole process. 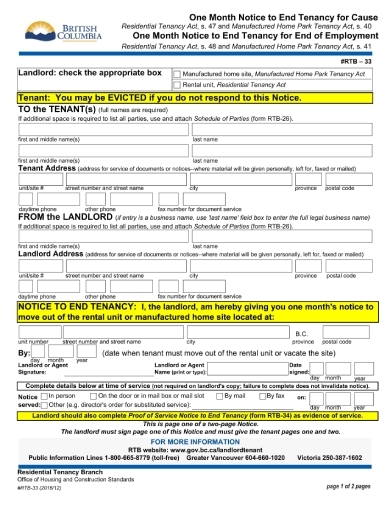 You can make this one-month notice to end tenancy example when making one for your own. As you can see, you should take into account the details that you need to include and make sure you provide spaces where to write it. A landlord has the right to cease or quit the tenancy of a tenant given that there is a probable reason, e.g. 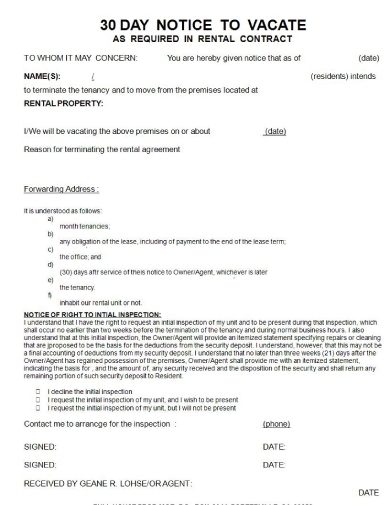 the tenant has continued to violate rules and policies stated in the agreement. You can take inspiration with how this example is written. 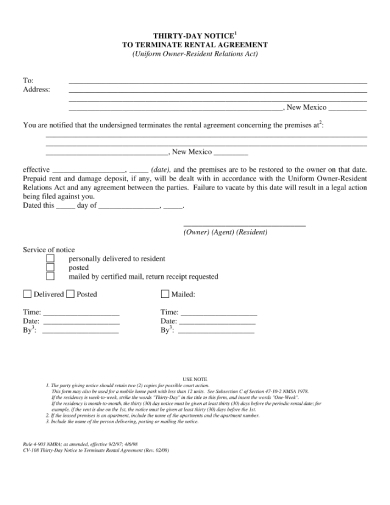 The first part is kept blank so that the document can be used for any tenant, the middle part provides the details that explain the reason for the decision, and the last part is a certification that it is from the landlord. 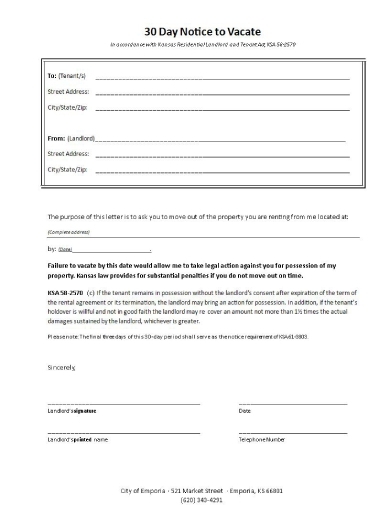 We hope we have provided useful templates and examples of a 30-day notice specifically intended for the tenant. You can download the templates and examples for free in this article.